Article first published as Cuban Beans and Rice on Blogcritics. Now the weather is starting to warm up and on some days, it's been humid. It's days like these that I'm reminded of my visits in Tampa, FL. While there, I got a chance to try some authentic Cuban cuisine unlike what I've had here in Chicago. Thinking about my visits to Tampa and Cuban fare, I was inspired to try my hand at Cuban Beans & Rice. I don't think this is quite authentic but it certainly tasted very much like the versions I had while in Tampa. The seasoned rice worked so beautifully with the black beans and I loved how it was light, fluffy and so packed with flavor! This recipe is similar to one I've made for Mexican Rice. The vegetables are sautéed until softened before adding rice to toast up. Beans and broth are added, brought to a simmer and then covered and baked until done. 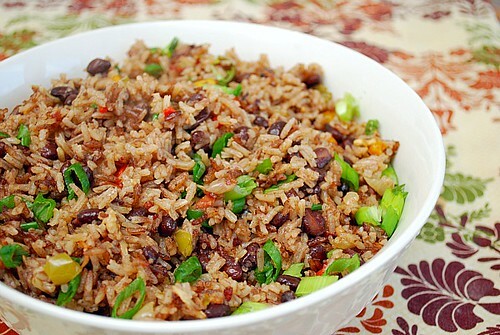 The result is a fluffy rice and bean dish that fully absorbed the flavors of the vegetables and seasonings. If you wanted to make this a one pot dish, you can toss in cooked chicken, roasted and shredded pork or even seasoned ground beef just before baking. In large Dutch oven with tight-fitting lid, sauté onions, garlic and bell peppers in oil over medium high heat until softened and translucent. Add the oregano, cumin and bay leaves and rice, stirring occasionally to coat. Once the rice has toasted a bit, add the bacon, entire can of black beans (undrained), chicken broth, and vinegar. Increase heat to medium-high and bring to simmer. Cover and transfer to oven. Bake until liquid is absorbed and rice is tender, about 30 minutes. Fluff with fork and let rest, uncovered, 5 minutes. Serve, passing scallion and lime wedges separately. I have actually been looking a for a recipe for really good rice and beans and I just found it! This sounds DELICIOUS! Maybe I can show my husband that I can cook rice too! Just made this and it's yummy! I made this and I liked it and I wanted to note that there is no oven temp listed in the recipe. I had it on 350 and it worked great.